Last Thursday I was invited to the Hawes and Curtis 100th Anniversary Party in Jermyn Street. Known as one of the most prestigious shirt makers in the world, their clothes have been sported by Edward VIII and Cary Grant, no less. So I couldn’t miss this opportunity to check out one of England’s most renowned heritage brands. Started in 1913 by Ralph Hawes and Freddie Curtis, they produce a vast array of high quality shirts for both men and women, as well as making their own line of suits and jackets. The anniversary night had a roaring twenties theme with a 1920’s Rolls parked on the pavement outside and waitresses decked out in traditional French maid style costumes – something that was of course met with my approval! The packed event was spread out over all three floors of the shop with a live jazz band and champagne for all. Pulling my usual ‘fashionably late’ card, I arrived just in time to gulp down a mocktail (a great non-alcoholic version of a cocktail) that was offered, before being taken for a personal shirt fitting. Hawes and Curtis make a huge range of shirts from the classic formal white version to some more outlandish styles. Naturally, I had to go for something on the exciting side, seeing as I am so understated and introvert…. Having been measured up (yes they do make shirts in my size! ), I was offered my pick from a vast selection and I think I made an excellent choice. It is always easy to go with a safe blue, white or striped shirt; however, going with something a little more on the daring side often pays off. It takes a certain person to be able to pull off a black and pink floral shirt and it is well worth the risk factor. 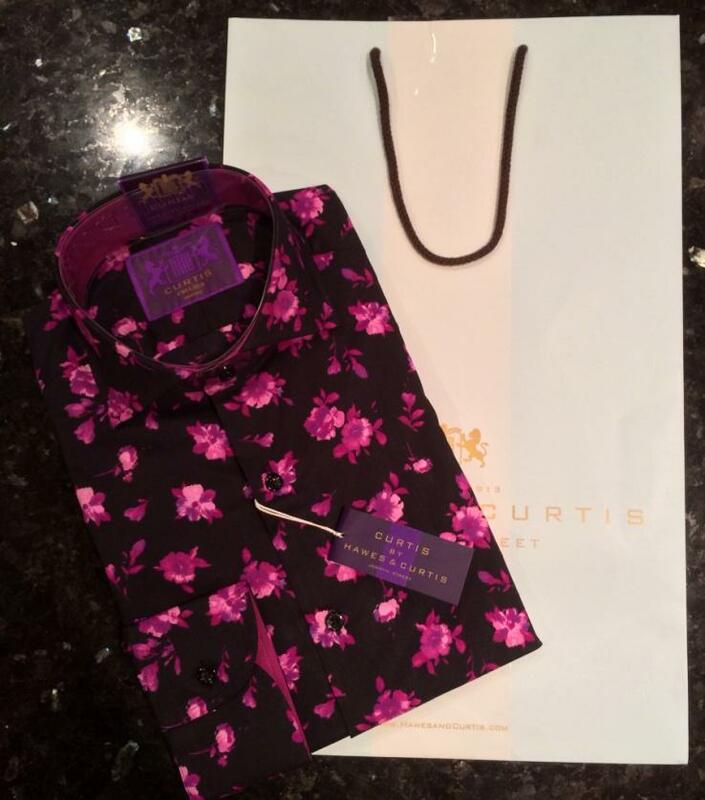 My new shirt from Hawes and Curtis. Like it? Love it more like! This shirt in particular has a great cut and fits extremely well; something that I am always keen to spot and often find difficult to discover. Thankfully, there is Hawes and Curtis – no wonder they have been so successful over the last 100 years.